Commenting on the woeful state of national political culture, House Speaker Paul Ryan tried to revive the perhaps flagging idealism of American young people in an address to a bipartisan group of House interns—one that may have also been intended for the ears of exasperated members of his own party. 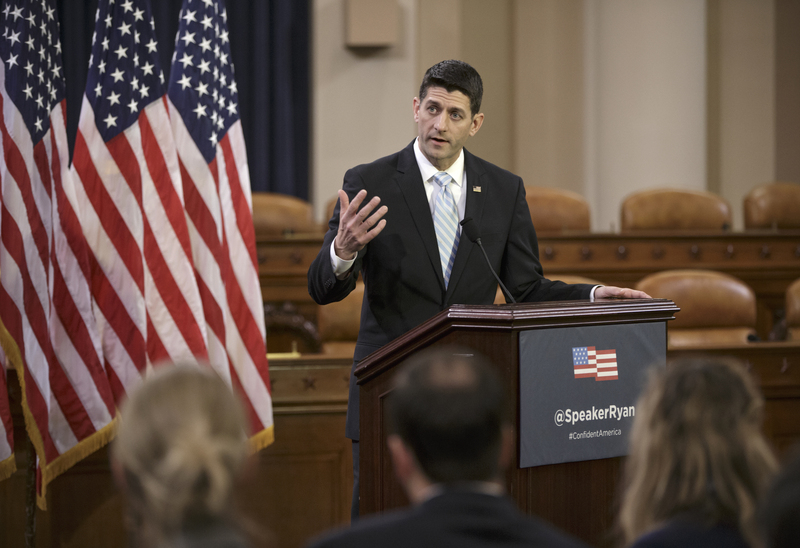 As many in the youthful crowd no doubt struggled to remember or even comprehend the era of bipartisan civility Ryan described, the Speaker assured them it could one day return, and acknowledged that his own deportment in the recent past may not have been exemplary. “In a confident America,” Ryan said, “we aren’t afraid to disagree with each other. “We don’t lock ourselves in an echo chamber, where we take comfort in the dogmas and opinions we already hold. We don’t shut down on people—and we don’t shut people down,” the speaker told the interns on March 23. “If someone has a bad idea, we tell them why our idea is better. We don’t insult them into agreeing with us. We try to persuade them. We test their assumptions. And while we’re at it, we test our own assumptions too. "I’m certainly not going to stand here and tell you I have always met this standard,” he added. “There was a time when I would talk about a difference between ‘makers’ and ‘takers’ in our country, referring to people who accepted government benefits. But as I spent more time listening, and really learning the root causes of poverty, I realized I was wrong. “‘Takers’ wasn’t how to refer to a single mom stuck in a poverty trap, just trying to take care of her family,” Ryan said. “Most people don't want to be dependent. And to label a whole group of Americans that way was wrong. I shouldn’t castigate a large group of Americans to make a point. Some will no doubt dismiss the speaker’s belated apology as too-little, too-late or mere cynical public relations, but who can say what his young audience will make of it? The House interns had been gathered in the Ways and Means Committee hearing room, where, Ryan pointed out, some of the nation’s most enduring public policies have been hashed out by Republicans and Democrats and where he first participated in the Washington political process as a young member of Congress. Ryan called it the perfect setting for his speech. “It is here, in this committee, that we debate some of the biggest, most consequential issues. Our tax code, health care, trade, entitlement programs, welfare reform. It’s a big deal to be on this committee. And understanding the privilege and the responsibility that came along with it, [committee members] took our job seriously. "And we always held ourselves to a higher standard of decorum. We treated each other with respect. We disagreed—often fiercely so—but we disagreed without being disagreeable.” He added, “It sounds like a scene unfamiliar to your generation. Ryan said the late Congress member Jack Kemp had been an inspiration to him as a young man, describing him as “a conservative willing—no, eager—to go to America’s bleakest communities and talk about how free enterprise could lift people out of poverty. These were areas that hadn’t seen a Republican leader come through in years, if ever. Clearly a vocation Ryan hopes his young audience might likewise accept, along with his challenge to rebuild a culture where politicians “don’t resort to scaring you, we dare to inspire you. His comments are a nice start, at least. Without freedom, there cannot be innovation, but this does not change the fact that unbridled capitalism, will eventually lead to atheistic materialism, and we ultimately end with rendering onto Caesar, what belongs to God. If we desire to be a culture that desires to inspire, we must begin by recognizing that a Civil Society is one that serves to proclaim God's Truth, not debate God's Truth. In recognizing that God Is The Author of Love, of Life, and of Marriage, our Founding Fathers recognized that God, not Caesar, Has endowed us with our unalienable Right to Life, to Liberty, and to The Pursuit of Happiness. There was a Time in Salvation History when we, as Catholic Americans, were not afraid to proclaim God's Truth about the Sanctity of every human life from the moment of conception, and the Sanctity of marriage and the family as God intended, but that was before we allowed our hearts to become hardened. Apart from The True God, no nation can remain civilized, and therein we have the crux of the matter.